Large chain supermarkets may have the budget and resources to invest in store lighting designers and refrigeration specialists for their store equipment. Specialty food stores and independent gourmet shops may not have that luxury however, they too can purchase the best lighting for their showcases. An investment decision or recommendation that will save their business thousands of dollars. The objective of recommending the best -- and the most cost effective -- commercial equipment products for new and existing display equipment is an objective that can be achieved without sacrificing sustainability objectives and compromising food quality and merchandising success. With fierce competition for shopper loyalty and each store trying to differentiate itself and its products while reducing operating costs, there is no better time than now to invest in supermarket equipment accessories and components that generate daily savings for the business owner. For commerical refrigeration cases, a retrofit installation of Econofrost night covers will help save energy, keep product and case temperatures colder, longer and improve product freshness and appearance. Especially in produce departments where shrink and discard savings can be even higher than energy savings! For fresh food display cases, the greatest returns are realized when the equipment has been properly installed with food safe lighting that illuminates the case without sacrificing color or product integrity. 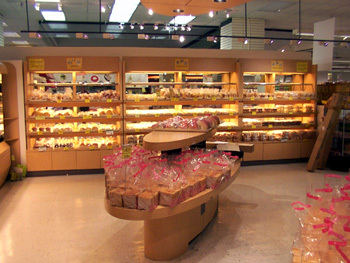 Promolux food lighting is a specialty light engineered just for fresh food showcases and any display case which merchandises perishable items that are heat and light sensitive. 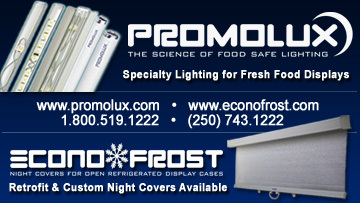 Supermarkets and other retail stores around the world are enjoying the many benefits of using Econofrost night covers and Promolux Food Lighting. Benefits such as: energy savings, improved product freshness and extended shelf life and lower operating costs. A grocery store's refrigeration equipment accounts for about 60% of the energy being consumed and the cost of the energy bill. It's not difficult to find stores spending over $600,000 per year in energy costs. A store can save hundreds or even thousands per month by investing in a premium quality night cover, like Econofrost. When it comes to merchandising fresh food cases, the longer a product stays on the shelf, the greater the chance the product will have to be reduced in price, remixed or discarded altogether because it fell victim to the effects of ambient heat and light. But for those retailers using Promolux lights in their case, they enjoy longer shelf life and product extension ensuring their shoppers buy only the freshest quality of items. Do you want to know how much you can save for your business? Give us a call or tell your lighting contractor or refrigeration specialist to give us a call toll free at 1-800-519-1222. Both products provide retailers with a quick return on investment, so each month you will be saving more and more money in operational costs and product losses!